With the expertise in manufacturing of a wide gamut of Royal Dewan Sitting, we make use of high quality wood and fabricate them with latest technologies. We acquire wood that is naturally extracted from trustworthy sources of industry. Providing a luxurious touch to the interiors of tent, these sofas have a proper wooden finish with a glossy melamine finish. Available in variety of contemporary and traditional designs, these are available through us at cost effective prices. The eminent name in Rajasthan for their services they have been providing since 1962, when Shri Rameshwar Lalji Laid the foundation of Taluka Tent Decorators, which is now lead by his son Shri Raj Kumar Taluka. TTD enjoys the reputation of being one of the premier rental firms providing equipment for a wide range of events including high profile weddings, Rajput Wedding, corporate events and exclusive venues Taluka's also extend their venture, being leading exporters of tents. Suppliers of tents,Taluka's also extend their venture, being leading exporters of tents. 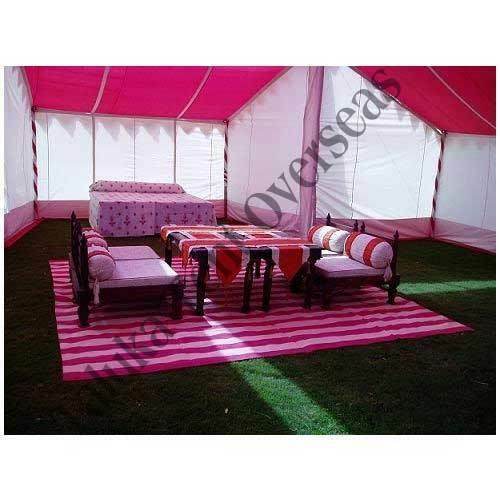 Suppliers of tents,traditional tents,canopies, marquees, and commercial tents, Taluka Tent Overseas is known for their outstanding services and quality.